The day has finally arrived! My first tournament with Cygnar after half year break! I have been preparing for the tournament for last couple of weeks and together with Tomasz Tutaj and Mateusz Dziewanowski we had high hopes for our results. Both Tomasz and Mateusz decided to take Mercenaries, the only two Mercenaries players at the whole tournament. Well… to be honest I was a little bit anxious 😛 but on the other hand I was playing Cygnar, the army considered by most people as not the strongest one, gently speaking. You can find the lists here. We also recorded a podcast that you can find here. So here we go! Sadly, my phone crashed the day after the tournament and my photos weren’t uploaded to the cloud. I will do my best to give an interesting account of games I played nevertheless. 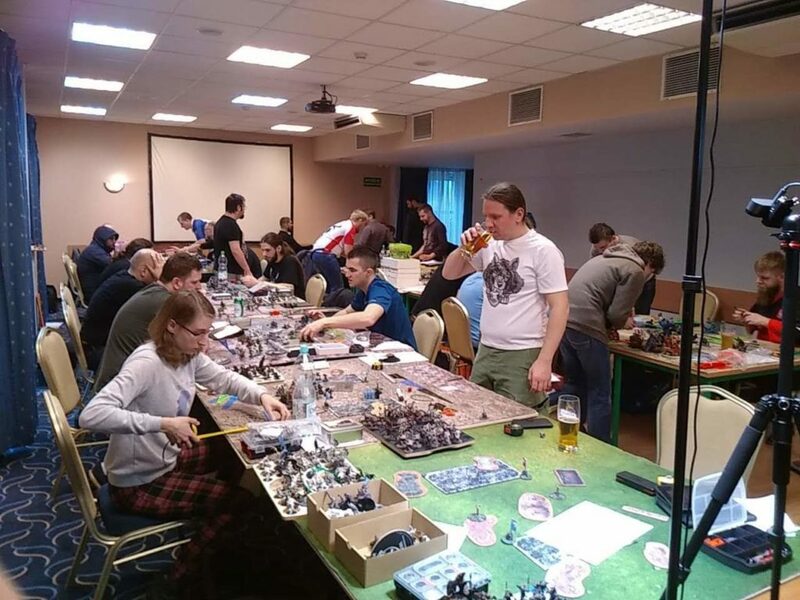 In the first round of the tournament we drew a team from Southern Poland with one mercenary from Warsaw – Jack, that you might know from reporting Grymkin games. Back then he was playing Khador. We had deal with Legion, Khador and Cryx. We got pairings we wanted and Tomasz was playing with Legion, Mateusz with Khador and I faced Cryx. I knew what I would play right away, as soon as I saw Slayer spam in one of the lists. And indeed, we played Nemo3 vs. Gaspy3. To be fair, I never played against Slayer spam before. I said that just couple of days before the tournament when we were recording our podcast, and well… here we are 😛 I was pretty sure that Nemo3 list can handle it. All depends on the amount of leaps I would get. I think the table was really favourable to me, there were two houses (one in the middle and one closer to opponent’s deployment zone on the left) that effectively split Piotr’s forces in half. Thanks to that I knew I could focus on one side first, not giving away too much on the other. Then the next round I would be able to finish the other side. I deployed fairly symmetrically, with Battle Engines on the flanks. I knew that arc nodes could be a potential cause of Nemo’s sudden death, so I had to be very careful. Piotr deployed his Slayers in a line and that view was intimidating, I must admit. No special surprises here, I ran as far as I could and put couple of upkeeps up. Piotr ran forward too. I decided that that would be my feat turn. I had to push one of the Slayers a little bit back, so Thunderhead could get a really juicy pulse. Caine and Ace knocked down two Slayers. Nemo feated and begun the slaughter, shooting the knocked down Slayer. Firefly shot at one of the arc nodes. Left Battle Engine charged in and missed his shot at knocked down Slayer… Unfortunately, due to Slayers’ placement, couple of electro leaps zapped the flag. Thead joined the party and used his pulse. I used my additional attacks to finish off one of the arc nodes and deal some damage to another Slayer. On the right flank, Firefly shot at the other arc node leaving his channeling system intact. I decided to go all in and charged in with the right Battle Engine. It finished off the last arc node and dealt significant amount of damage to Slayers. Piotr didn’t give up and fought back. He managed to almost kill my left Storm Strider, leaving him on 1hp to my surprise, with a crippled Slayer! On the other flank, Machine Wraith blocked my Repulsor Field effect and one of the Slayers could charge the right Battle Engine, but it survived. Gaspy used his feat. I healed my left Storm Strider, just in case, and managed to clear the left side. I controlled my flag, the left zone and killed the objective, scoring 3 points this way, 3:0. Piotr contested the left zone and this time easily killed my right Battle Engine. Unfortunately, he couldn’t contest my flag so I scored another point in his turn. 4:0 in my favour. I scored another point on my flag and won the game. All in all, it was a really nice game and we had some fun. Thanks Piotr for the game! We won this round 2:1 and were ready to play another round. Previous Post:Game #35 Kallus2 vs. Jaga-Jaga – Light ‘Em up!